Guest, general show on writing, blogging and inspiring writing, http://www.youtube.com/watch?v=zsphdcC5jJE on Tom Corson-Knowles video podcast, January 20, 2014. Guest, “How to Achieve More Inspired Results,” Might Radio: Evoke, Educate, Empower with Gabrielle van Rij, http://www.voiceamerica.com/episode/75507/nina-amir-shares-her-wealth-of-information-with-you-on-how-to-achieve-more-inspired-results, January 24, 2014. Guest, “How to Blog a Book,” Giving Voice to Your Story, http://www.blogtalkradio.com/creatingcalmnetwork1/2013/10/18/giving-voice-to-your-story-with-dorit-sasson, October 18, 2013. Guest, “How to Use a Book and a Blog to Boost Your Coaching Business,” http://www.incrediblecoach.com/articles/05-incredibletalks-interview-with-nina-amir-how-to-use-a-book-and-a-blog-to-boost-your-coaching-business, www.incrediblecoach.com, August 2013. Guest, “How to Blog a Book, http://thirdiradio.com/blog-a-book/, ThirdIRadio, August 16, 2013. Guest, “How to Blog a Book,” Romance Writers of America (local Northern CA branch), May 6, 2013. Guest, Nonfiction Author’s Association, Blogging Books, http://nonfictionauthorsassociation.com, November 20, 2013. Guest, “How to Blog Books,” The Professional Content Creation Podcast, http://professionalcontentcreation.com/blog-a-book, April 5, 2013. Guest, “The Contentprenuer,” www.33voices.com, http://www.33voices.com/posts/the-content-entrepreneur, March 11, 2013. Guest, “Blogging Books,” http://www.newbiewriters.com, scheduled for October 12, 2012. Guest, “How to Blog a Book,” Geekpreneur, hosted by Yvonne Thompson, New Media Entertainment Ltd., September 2012. Guest, “Blogging books,” WCCO radio (CBS in the Minneapolis), August 2012. Guest, “How to Blog a Book,” National Memoir Writer’s Association Roundtable, July 12, 2012. Guest, “How to Blog a Book,” PUNCH! Media & Marketing Made Easy with Erika Montgomery (KDOW or stream on KDOW.biz), June 23, 2012. · Guest, “Meet Nina Amir, Author of How to Blog a Book,” hosted by Quinn Barrett at Wise Bear Books radio show, June 13, 2012. Guest, “How to Blog a Book,” “No Publisher Needed with Jim Kukral, June 20, 2012. Guest, “How to Blog a Book,” Michelle Vandepas, TalkingPurpose, May 31, 2012. Featured Guest, “How to Blog a Book,” No Publisher Needed with Jim Kukral, January 2012. Featured Guest, “How to Combine Passion and Purpose to Achieve Your Potential,” Billy the Brain Radio Show with Bill Frank, KKZZ1400 AM, Ventura, CA, November 2011. Featured Guest, “How to Blog a Book,” Published and Profitable membership teleseminar with Roger C. Parker, November 2011. Featured Guest, “How to Blog a Book,” National Memoir Writer’s Association Teleseminar, October 2011. Featured Guest, “Moving through Fear and Kabbalah of Conscious Creation,” The Lisa Wexler Show!, lisawexler.com/ February 28, 2009. Featured Guest, “Moving through Fear,” WICC600, March 4, 2009. Regular Featured Guest, spirituality and holiday expert, on Conversations with Mrs. Claus podcast, www.thefamilyyak.com, once a month beginning January 2008 through 2009; sporadically through 2010. Conversations with Ms. Claus is a podcast downloaded in more than 90 countries by 110,000 listeners every month. The show is now running archived shows. Featured Source, Jewish Woman Magazine (print edition), “Creating Sacred Space” by Rahel Musleah, Winter 2013. Featured Source, “Blog a Book,” The Star, Online, Thailand (http://thestar.com.my/lifestyle/story.asp?file=/2012/5/29/lifebookshelf/11140706&sec=lifebookshelf), May 29, 2012. Featured Source, feature article on subject of author’s upcoming speaking engagement, The Daily Herald, Tri-City Edition, St. Charles, IL, May 22, 2008. Expert Source, article on creating sacred space for families, Family Time magazine, December 2007. Expert Source, article on practicing Judaism in small town America, Jewish Woman magazine, Winter 2000. “Spiritual Retreats for Inner Bliss” plus sidebar “Go Within and Stay Put,” South Bay Accent, December 2013/January 2014. “Got to Dance: Good for the Body and the Soul,” Bay Area Parent 2013-14 Education and Enrichment Guide, July 2013. “Blog Your Way to a Book Deal,” Writer’s Digest Magazine, September 2012. 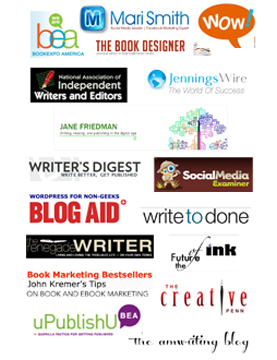 22 blog posts at popular blogs during a recent blog tour. a variety of articles on Jewish topics published on www.Jewishmagazine.com, a site visited by over 3,000 people daily. 2 reported columns and 4 essays for www.interfaithfamily.com, which were published September-December 2008. 11 essays related to The Kabbalah of Conscious Creation distributed to e-zines. wrote and offered a variety of essays to on-line ezine directories that were picked up and published extensively in e-zines and blogs all over the world. has published articles and essays in 45+ local, national and international publications, including JewishMag.com, Interfaithfamily.com, Chicago Jewish News, Atlanta Jewish Times, and J. The Jewish Journal of Northern California as well as in other publications, like Grocery Headquarters, Pet Business and Twitter for Business.